Jaguar has created its most powerful and extreme road car ever, with the launch of the 600PS XE SV Project 8. The supercharged saloon will cost £149,995 and be capable of covering 0-60mph in just 3.3 seconds. Limited to 300 hand-built examples in left hand drive, the Jaguar XE SV Project 8 will have supercar performance to accompany its gargantuan price tag, with power supplied by a 5.0-litre supercharged V8. With 0-60mph taking a smudge over three seconds, Jaguar claims that this is the fastest accelerating production car it has ever built. 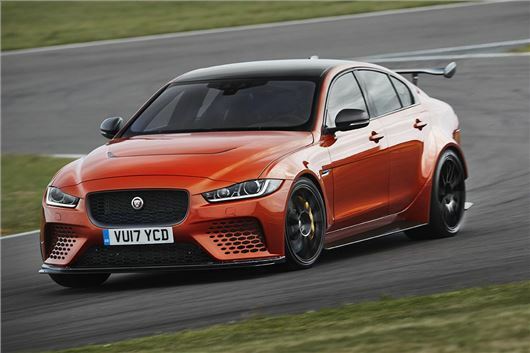 Capable of reaching 200mph, the Project 8 features a number of notable modifications over the standard saloon, with carbon fibre bumpers, huge cooling air ducts and a front splitter. The bonnet, which is also made from carbon fibre, gets a huge air vent to help cool the V8 engine at the front, while flared bodywork coverings, 20-inch alloy wheels and a huge rear wing completing the track look. The all-wheel drive XE SV Project 8 gets double-wishbone front and Integral Link rear suspension with stiffer springs and manually adjustable dampers that will allow the driver to lower the ride height by 15mm when on track. The Titanium quad exhaust, meanwhile, will ensure everyone hears the XE's arrival, with Jaguar promising a supersonic soundtrack. Inside, carbon fibre covers almost everything, from the gearbox casing, dashboard, steering wheel and instrument binnacle. The eight-speed quick shift transmission can either be operated by aluminium paddle shifters behind the compact steering wheel or by a central gear lever. The driver can also tailor the throttle and steering responses or instruct the on-board computer to give the full octane experience, thanks to a dedicated track mode that will switch off the electronic traction control and body stability. The Jaguar XE SV Project 8 will be available as a four or two-seater, with the optional Track Pack adding carbon fibre racing seats with four-point harnesses fixed to a retention hoop in place of the rear bench. If that sounds a little too wild for your family car needs, then a standard four-seat model will also be available. The Project 8 will be the first hand-assembled car to emerge from Jaguar's high performance SVO centre in Coventry, but potential buyers will have to 'apply' for permission to get one by visiting their local dealer. That aside, the £150,000 XE is available to order now.